Coyotes may be seen at any time of the day — they are diurnal animals, however for convenience in urban areas they have arranged their daily schedules to avoid human activity, so in cities they are active mostly at night when we are not. They can do this because their eyes have many more rod receptors than the human eye has, so they can see in the dark: they have night-vision. 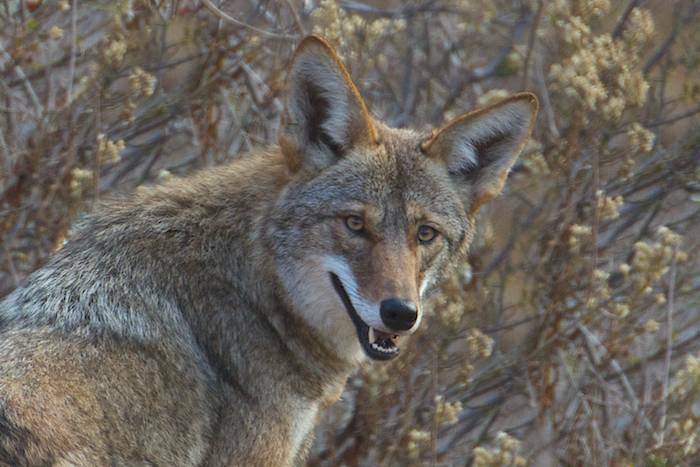 Coyotes, like dogs and cats, have retinas that are almost entirely composed of rods. They have a superabundance of rods with only few cones. Rods require less light to activate than cones, but they only allow you to see black and white; having lots of rods means great night vision. Humans, on the other hand, have predominantly cones and fewer rods. Cones require a lot of light to be fired up, but they allow color vision in bright daylight and they produce a very sharp vision. Cones do not respond to low light: under low light, humans rely on their lower number of rods. Note that for us, at dawn, dusk and nighttime, everything looks black and white, and not very clear or sharp, and we can’t see far. Rods have a photosensitive pigment called rhodopsin which is particularly sensitive to low light. This pigment actually breaks down in strong light rendering it ineffective during the day, but at night, and when there is a superabundance of the rods as is the case with coyotes, the pigment is created faster than it breaks down. So these animals, out at night, can see pretty well even though you can’t, but they cannot see as sharply as those of us who use cones in daylight. In addition to more rods, there is another factor which aids coyotes and other critters in their night vision. Have you ever noticed that if you take a photo of animals at night, their eyes shine? This is because they have a sort of “mirror”, called a tapetum lucidum, beneath their retina. This collects and re-emits light back into the retina, giving the rods a second chance to absorb visual information, enhancing their ability to see clearly in low light conditions. Other adaptions allow a number of animals to function at night and during the daytime, such as slit-eye pupils which cats and foxes have. Their pupils can open completely during the night, yet the slit protects their eyes from bright daytime light. One of the adaptations of owl eyes — owls only function at night — is the huge size of their eyes: their eyes often take up a full half of the room in their skulls. The increased retinal surface of large eyes permits even more rods which can collect even more ambient light. Since owl eyes are so large and must fit tightly into their sockets, owls cannot swivel their eyes in their sockets like we can. Instead, they rotate their heads at the neck to focus on different things. They can rotate their necks a full 270º! So, coyotes are diurnal and can see well at any time, whereas humans see best when there is plenty of light. The interesting thing is that coyotes seem to know where human perception lies, that we can’t see well at night — I saw an example of this just a few days ago. As I watched this older coyote in the photo below, he became aware that I was watching, and he curled up in a ball to watch back. 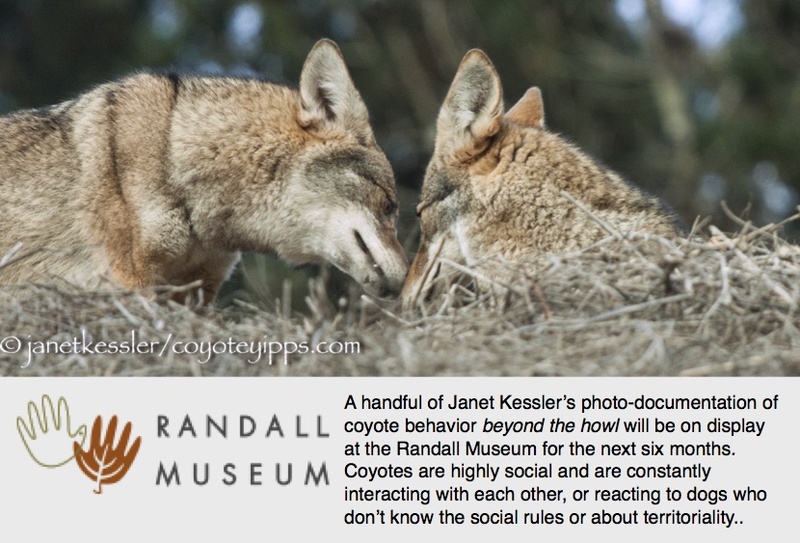 Coyotes do this often — they’ll watch back and be just as entertained as you are! It got darker and darker and pretty soon I could no longer make out any details about this fella lying in the grass — in my eyes, he became a barely perceptible colorless bump in the grass. As he lay there, a group of five young women began approaching. They were not quiet and sedate, but animated and active. It was a Friday night and they were headed-out excitedly together. You would have thought the coyote would move — he was only 8 or so feet off the path. But as I watched, fascinated, the coyote remained exactly where he was, and the girls walked by without even seeing the coyote right next to them. The coyote didn’t move because he knew from experience that he would not be detected at all. I’m not sure whether the girls thought he was just a pile of dirt or a rock, or if they even noticed that. I approached them afterwards, and asked, and they said they had had no idea. might i post this to my blog giving you credit? Rick Meril.